We all have that particular piece of jewelry that you purchased in your youth. A piece that at the time, was at the height of fashion. Years later it sits in your drawer, showing its age and could not be more out of style. Or it might be a piece that you were given and now has lost its meaning in your life. You may even have a piece that was damaged and the cost to restore it is more than what the piece is worth. 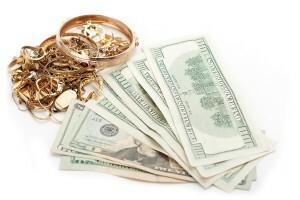 Red D Cash can turn that unwanted, broken or discarded piece of jewelry into cash for you in a matter of minutes. We are your local answer. We weigh and verify your gold or silver pieces right in front of your eyes. Your jewelry never leaves your sight, allowing you to stay in control and receive your cash fast. You no longer have to deal with the worries of sending your valuable jewelry in the mail worrying if your jewelry made it safe or if it will be lost. You also do not have to deal with the long wait to receive your money after you mail off your jewelry, waiting for the piece to get there, waiting for the piece to be inspected and verified and then waiting for the check to be mailed back to you. On top of all of that waiting, they end up issuing you a paper check and now you have to find somewhere to cash it. Worst of all now you will have to pay a check cashing fee to get your hard earned money. We are your local alternative and we pay cash. We also offer one of the most competitive payouts in the area. Bring in the piece you would like to sell along with your current government issued photo I.D.